New York.- The First National Leadership 100 Sunday was observed in hundreds of Greek Orthodox parishes across the country on Sunday, October 18. Parish Priests read the Encyclical issued by His Eminence Archbishop Demetrios on behalf of the Holy Eparchial Synod and members of Leadership 100 spoke of the 25-year-old mission of the organization founded in 1984 to support the National Ministries of the Greek Orthodox Archdiocese and to advance Orthodoxy and Hellenism in America. The date was chosen as the Sunday prior to the Feast Day of St. Iakovos, a tribute to Archbishop Iakovos of Blessed Memory, the visionary Founder and namesake of the Archbishop Iakovos Leadership 100 Endowment Fund. Arthur C. Anton speaks at Annunciation Cathedral in Boston. Next to him Fr. Cleopas Strongilis. Constantine G. Caras, Vice Chairman of Leadership 100 who was named Chairman of National Leadership 100 Sunday by Stephen G. Yeonas, Leadership 100 Chairman, said some 70 Parish Chairmen organized programs in the Direct Archdiocesan District of New York and the Metropolises of Chicago, Pittsburgh, Boston, Denver, Atlanta, Detroit, San Francisco and New Jersey. Members of Leadership 100 volunteered to speak in parishes not covered by Parish Chairmen. 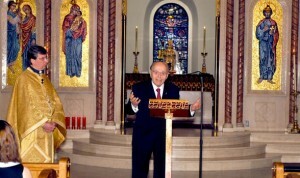 At the Annunciation Greek Orthodox Cathedral of New England in Boston, Father Cleopas Strongylis, Dean, called on Leadership 100 Founding Member and former Chairman, Arthur C. Anton, who gave the congregation a stirring recount of the origins of Leadership 100, organized in 1984 to meet the critical financial needs of the Church. Arthur and Madeline Anton hosted a reception and said a seminarian from Holy Cross came up to him to thank him and Leadership 100 for making it possible for him to study for the Priesthood and to prepare for Ordination. At St. Demetrios Church in Weston, MA, Fr. Nicholas Krommydas offered a moving tribute to Leadership 100 for its valuable support of the National Ministries of the Greek Orthodox Archdiocese while George E. Safiol, Leadership 100 Treasurer and member of the Executive Committee, addressed the support Leadership 100 has given Holy Cross Theological School, emphasizing the scholarships provided for seminarians. He also cited the fact that Leadership 100 absorbed the student loans of numerous active Clergy who had studied at the school, enabling them to focus on their ministries. At St. Mark Greek Orthodox Church in Boca Raton, Florida, Lou and Helen Nicozisis were on hand when Fr. Robert Archon spoke on Leadership 100. Lou, who is a member of the Executive Committee, gave a stirring presentation on the mission of Leadership 100 and was interrupted three times by the applause of the congregation. At the Archdiocesan Cathedral of the Holy Trinity in New York City, the Dean, Rev. Dr. Frank Marangos spoke from the pulpit on the numerous accomplishments of Leadership 100 and the vital role this Endowment Program has played in providing funding for the National Ministries of the Greek Orthodox Archdiocese. Fr. 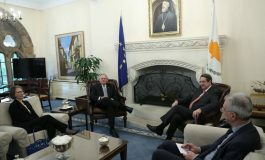 Frank acknowledged Leadership 100 Board Members, George Tsandikos and Froso Beys, who hosted a reception following the Divine Liturgy, at which one surprising result was two new members for Leadership 100 recruited by both hosts, namely, The Kallinikeion Foundation and Demetrios Poll. At the St. Nicholas Shrine in Flushing, New York, Father Paul Palesty offered an inspirational message on Leadership 100 and prepared 1,500 bulletin inserts on the Leadership 100 program for distribution to the parishioners. Parish Chairman Steve Cherpelis offered moving remarks at the reception emphasizing the vital ministries of our Church supported through Leadership 100. At Holy Trinity Church in Wilmington Delaware, Father Constantine Christofis expressed his gratitude to Leadership 100 for the valuable support it offers to the Church and the National Ministries. Constantine Caras showed the DVD at the coffee hour. It depicted the story of Leadership 100 and the numerous grants it has distributed. At Saint Sophia Cathedral in Washington DC, Father John Tavlarides, the Dean, spoke extensively on Leadership 100 and the valuable support it offers to the retired Clergy. Parish Chairmen and members James and Theodore Pedas were on hand to personally greet parishioners and fellow Leadership 100 members. At St. Demetrios Church in Rocky River, Ohio, Father James Doukas was moved to tears as he described the critical support Leadership 100 had provided over the years to support seminarians studying for the Priesthood at Holy Cross Theological School. Parish Chairmen and Board Members, Angelo Coutris and Mike Henry said that Father James’ remarks brought applause from the congregation when he emphasized that funds amounting to $11,403,617 were distributed to worthy seminarians for the Scholarship Program. At Assumption Church in Chicago, Father Timothy Bakakos spoke extensively on Leadership 100 and the good works that it does and Co-Chairmen and Members, James A. Regas, Leadership 100 Legal Counsel, Lou Malevitis and Dr. John Panton hosted the coffee hour and elaborated on the ministries which have been supported over the years through Leadership 100 grants. At the Annunciation Cathedral in Chicago, Chairman Chris Tomaras gave a PowerPoint presentation at the reception and described in detail how Leadership 100 grants are distributed. At St. Nicholas Greek Orthodox Church in Troy, Michigan, Leadership 100 member George P. Psihas went all out to organize a program with Fr. Stratton Dorozenski. A Leadership 100 sign went up, Leadership 100 pamphlets were inserted in church bulletins, which also carried an entry on National Leadership 100 Sunday and a list of Leadership 100 members who belonged to the parish, and other pamphlets describing Leadership 100 grants were placed on tables at the coffee hour where the Leadership 100 DVD was shown. Organized in Denver in 1984 under the guidance of Archbishop Iakovos, The Archbishop Iakovos Leadership 100 Endowment Fund, named in his honor, became a separately incorporated endowment fund in 1998 with the purpose of supporting the National Ministries of the Greek Orthodox Archdiocese of America and advancing Orthodoxy and Hellenism. Leadership 100 has distributed more than $28 million in grants, including scholarship funds for Holy Cross School of Theology, reduction of the student loan burden of active clergy, assistance to retired clergy and presvyteras, and support of an information infrastructure, Internet Ministries, Home Mission, youth and family ministries, and Religious and Greek Education at the Greek Orthodox Archdiocese. 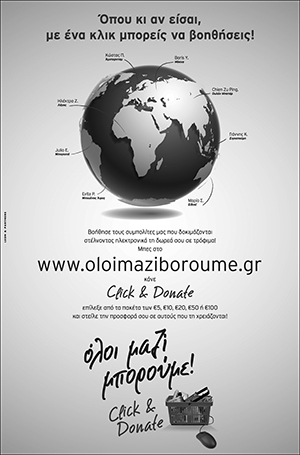 It also provided assistance after the September 11 national tragedy, Hurricane Katrina, the devastating fires in Greece, as well as seed funding for both the International Orthodox Christian Charities (IOCC) and the Orthodox Christian Mission Center (OCMC). Today, Leadership 100 counts more than 825 members from a broad spectrum of Greek Orthodox leaders, men and women of all ages from every field of endeavor, including 86 Leadership 100 Partners, young Greek Americans given an opportunity to join at a lower contribution level, progressing as they pursue their careers.